XTrade Corporation, a partner in the world's premier Global Trade Alliance, gives you the resources you need to increase your bottom line. Tens of thousands of Business Owners and Professionals already trade in the alliance. 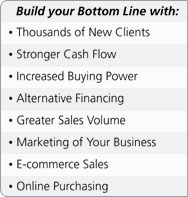 Earn Trade Dollars from these new customers and put your new purchasing power to work running your business, expanding your operations, or enhancing your personal standard of living without spending cash. Unlike being a member of a small independent exchange, Member's of Trade Exchanges that participate in the Global Trade Alliance are empowered with online worldwide trading combined with a broker-centric network of barter professionals to assist you in facilitating trades locally, across the country or across the globe.